(Nanowerk News) Researchers at AIST in Japan have developed a fibrous material with a specific surface area of 2240 m2/g by using single-walled carbon nanotubes (SWCNTs). Materials with large specific surface areas are used for energy storage as electricity storage devices including capacitors. They are also used for storage, purification and separation of substances. Many existing materials are brittle and it was difficult to make them into easy-to-handle solids while maintaining their specific surface areas. In this study, the tips and walls of the aligned SWCNTs synthesized using “Super Growth method” were holed by oxidation. A fibrous material with a specific surface area of 2240 m2/g was produced by this opening process. The specific surface area of the new material is larger than that of porous silica and activated carbon which are exiting materials with high specific surface areas. A prototype capacitor that was fabricated by using this material as its electrodes was found to have a high energy density of 24.7 Wh/kg and a high power density of 98.9 kW/kg. The performance of the prototype was better than that of conventional capacitors. Furthermore, substances that are included in the SWCNTs can be selected by adjusting the hole diameter, which is controlled by varying the temperature in the opening process. It is expected that this novel electrode material will help realize a compact, light, high-performance capacitor. Further, the material is expected to have a wide variety of applications, ranging from energy storage to substance storage. Details of the results will be published in a German scientific journal Advanced Functional Materials. The materials with large specific surface areas are used in dehumidifiers and deodorizers because of their high adsorption ability; they are also used for sensors and the purification and separation of substances utilizing their large interaction with other substances. They have a wide variety of applications, ranging from domestic to industrial applications. Recently, hybrid, electric, and fuel-cell vehicles have attracted much attention. This has resulted in an increased interest in the materials that can be used for energy storage, such as electrode materials used in capacitors and fuel cells. Materials with large specific surface areas include porous silica and activated carbon. These materials are, however, amorphous and brittle and most of these materials exist as powders. There is a problem that the specific surface areas of the materials became small when they were made into solids for easy handling. With a growing interest in high-performance electricity storage devices, the development of alternative materials with large specific surface areas to these materials is required. SWCNTs attracted attention because their specific surface areas did not become small even when they aggregated; hence, they did not suffer from the disadvantages of conventional materials with large specific surface areas. However, a SWCNT material with a specific surface area close to the theoretical value (2630 m2/g) has not yet been obtained. Only small values (240-1250 m2/g) have been reported so far. AIST developed the Super Growth method—a synthesis method for SWCNTs—and an oriented high-purity SWCNT structure in which SWCNTs are vertically aligned (This structure is named “CNT Forest.”). AIST has recently developed a technique for densifying this aligned structure and has been conducting research on utilizing this structure as electrode materials for capacitors. The Nanotube Research Center and the Energy Technology Research Institute of AIST jointly pursued researches on the use of SWCNTs in capacitor electrodes including a research on a processing method for increasing the specific surface area. Consequently, we developed the new materials. This development is a result of the "Nanotechnology Program: Carbon Nanotube Capacitor Development Program," commissioned by the New Energy and Industrial Technology Development Organization (NEDO). The CNT Forest synthesized by the Super Growth method consists of SWCNTs (99.5%) and the SWCNTs are aligned in a single direction. 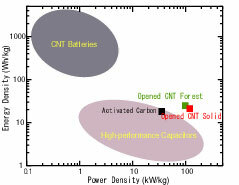 The SWCNTs in CNT Forest have larger diameters and are of higher purity than other SWCNTs. Focusing on these characteristics, we examined opening process by oxidation, through which the tips and walls of SWCNTs were holed to increase their specific surface areas. The CNT Forest was heated to temperatures of 350 to 600 °C at a rate of 1 °C/min in dry air and oxidized by oxygen in air in order to hole the structure. Brunauer-Emmett-Teller (BET) method based on the adsorption of nitrogen molecules was used to measure specific surface areas. The specific surface areas of the samples holed by oxidation in air are shown in Fig. 1. In the figure, the blue and red bars represent the specific surface areas of inner and outer surface of the SWCNTs, respectively, while the white circles represent the weight-decrease ratio of the samples. In the sample heated to 500 °C and holed, significant weight loss, namely weight loss caused by the burning of SWCNTs, was not observed. The specific surface area of the sample was 2240 m2/g, a substantial increase from the specific surface area of an untreated sample (1300 m2/g). The value for the treated sample was compared with the theoretical value (2630 m2/g); it was thus concluded that approximately 85% of the carbon atoms of the SWCNT are surface atoms. Fig. 1 : The treatment-temperature dependence of the specific surface areas and weight-decrease ratio of CNT Forest. Blue: the specific surface area of the outer surface; red: the specific surface area of the inner surface;?white circle: weight-decrease ratio. The aligned SWCNT structure can be densified by using a solvent. The densified aligned SWCNT structure (called “CNT Solid”) was holed in an identical manner. The resulting specific surface area was 2190 m2/g. This is equivalent to a surface area per unit volume of 1310 m2/cm3. 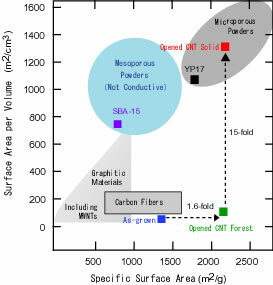 The specific surface areas of the both samples are much larger than that of commercially available porous silica (SBA-15, 750 m2/g) and that of activated carbon (YP17, 1700 m2/g) (Fig. 2). Fig. 2 : Comparison of the specific surface areas of existing materials and developed materials. The properties of the developed materials as capacitor electrodes were examined. The materials with different temperatures were examined as electrodes using tetramethylammonium tetrafluoroborate/propylene carbonate as electrolyte. The electrode material treated at 525 °C attained an energy density and a power density of 24.7 Wh/kg and 98.9 kW/kg, respectively. This new capacitor shows better performance than a capacitor with activated-carbon electrodes (16.9 Wh/kg and 35.7 kW/kg) and a high-performance capacitor with electrodes made of low-purity carbon nanotubes with a small specific surface area. Consequently, it is expected that the new material can be used in electricity storage devices for electric vehicles, etc. (Fig. 3). Fig. 3 : Comparison of the performance of the prototype high-performance capacitor and existing products. 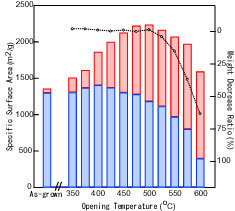 The heating temperature (500 °C) at which the specific surface area measured using nitrogen molecules reached a maximum differed from that (525 °C) at which the best performance of a prototype capacitor using ionic electrolyte was achieved. This may be because the size of holes on the surface of oxidized SWCNT wall increased by higher temperature treatment and was made suitable for larger molecules. This suggests that it may be possible to select substances stored inside the SWCNT by controlling the conditions of the opening process. In order to encourage institutions and companies to develop applications of the SWCNT materials with high specific surface areas, AIST will supply the gram-order samples of the materials. Furthermore, AIST will collaborate with Zeon Corporation to develop a technique for the industrial mass production of CNT Forest, which is used to obtain a material with a high specific surface area, and a high-performance capacitor will be developed in collaboration with Nippon Chemi-Con Corporation; these will be carried out under the "Nanotechnology Program: Carbon Nanotube Capacitor Development Program," commissioned by NEDO.